در این تحقیق یک روش جهت اندازه‌گیری آفلاتوکسین در زعفران با استفاده از کروماتوگرافی مایع با کارایی بالا مجهز به آشکارساز فلورسانس ارائه شده است. در این روش آفلاتوکسین با استفاده از متانول 80% استخراج و سپس توسط ستون ایمونوافینیتی تخلیص شد. اندازه‌گیری‌ها در طول موج تحریک 365 و طول موج نشری 445 نانومتر انجام گرفت. حد تشخیص آفلاتوکسین‌های B1، B2، G1و G2 به ترتیب 293/0، 08/0 ، 55/0 و 30/0 می باشد. 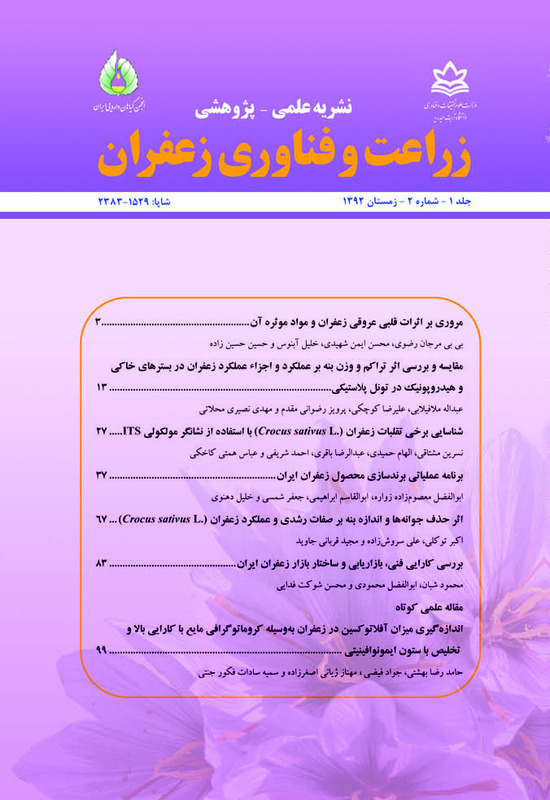 درصد انحراف استاندارد نسبی در اندازه‌گیری انواع آفلاتوکسین بین 1/5-33/1 و میزان درصد بازیافت نیز در محدوده 67-94 می باشد. با توجه به نتایج روش کروماتوگرافی مایع با کارایی بالا به‌کار گرفته شده در این تحقیق می‌توان به توانایی این روش در تعیین و اندازه‌گیری گونه‌های مختلف آفلاتوکسین در زعفران پی برد. In this paper, method based on high performance liquid chromatography with fluorescence detection has been suggested to measure aflatoxin in saffron. This method required a simple extraction of aflatoxin using MeOH/H2O (80:20, v/v) and a purification by immunoaffinity column cleanup. Aflatoxin measurement was performed at an emission wavelength of 445 nm and an excitation wavelength of 365 nm. Detection limits for AFB1, AFB2, AFG1 and AFG2 were 0.293, 0.08, 0.55, and 0.30 ng g-1, respectively. The percentage of Relative standard deviations for measuring aflatoxin is in the range of 1.33-5.10 % and the percentage of recovery is in the range of 94-67. Regarding The overall results of high-performance liquid chromatography applied in this experiment, we can realize that this method can be used for detection and measurement of different kinds of aflatoxins in saffron. Abdullaev, F.I. 1992. Biological effects of saffron. Biofactors 4: 43-45. Abdullaev, F.I. 2002. Cancer chemopreventive and tumoricidal properties of saffron (Crocus sativus L.). Experimental Biology and Medicine 227: 20-25. Abdullaev, F.I., River´n-Negrete, L., Caballero-Ortega, H., Manuel Hernandez, J., Pérez-L´pez, I., and Pereda-Miranda, R. 2003. Use of in vitro assays to assess the potential antigenotoxic and cytotoxic effects of saffron (Crocus sativus L.) Toxicology in Vitro 17: 731–6. Adegoke, G.O., Allamou, A.E., Akingbala, J.O., and Akanni, A.O. 1996. Influence of sundrying on the chemical composition, aflatoxin content and fungal counts of two pepper varieties—Capsicum annuum and Capsicum frutescens. Plant Foods for Human Nutrition 49(2): 113–117. Akiyama, H., Goda, Y., Tanaka, T., and Toyoda, M. 2001. Determination aflatoxin B1, B2, G1 and G2 in spices using a multifunctional column clean-up. Journal of Chromatography A 932: 153-157. Barbesgaard, P., Heldt-Hansen, H.P., and Diderichsen, B. 1992. On the safety of Aspergillus oryzae L.: a review. Applied Microbiology and Biotechnology 36: 569–572. Bartine, H., and Tantaoui-Elaraki, A. 1997. Growth and toxigenesis of Aspergillus flavus isolates on selected spices. Journal of Environmental Pathology, Toxicology and Oncology 16: 61–65. Berardo, N., Pisacane, V., Battilani, P., Scandolara, A., Pietri, A., and Marocco, A. 2005. Rapid detection of kernel rots and mycotoxins in maize by near-infrared reflectance spectroscopy. Journal of Agricultural and Food Chemistry 53: 8128–8134. Caller, E., Marrubini, G., Brusotti, G., and Massolini, G. 2007. Development and integration of immunoaffinity monolitic disk for the on- line solid-phase extraction and HPLC determination with fluorescence detectionof aflatoxin B1 in aqueous solutions. Journal of Pharmaceutical and Biomedicalanalysis 44: 396-403. Fazekas, B., Tar, A., and Kovacs, M. 2005. Aflatoxin and ochratoxin a content of spices in Hungary. Food Additives and Contaminants. 22(9): 856-863. Institute of Standards and Industrial Research of Iran (ISIRI). 1382. Food products - Determination of aflatoxin B1 and total aflatoxins using HPLC and immunoaffinity column – Test method. 1st. Revision. ISIRI No. 6872. Kamkar, A. 2006. A study on the occurrence of aflatoxin m1 in Iranian feta cheese. Food control 17: 768-775. Martins, M.L., Martins, H.M., and Bernardo, F. 2001. Aflatoxins in spices marketed in Portugal. Food Additives and Contaminants 18(4): 315–319. Negbi, M. 1999. Ed. Saffron: Crocus sativus L. In: Medicinal and Aromatic Plants - Industrial Profiles. Taylor & Francis Publications, ISBN 978-90-5702-394-1. Papp, E., H-Otta, K., Zaray G., and Mincsovics, E. 2002. Liquid chromatographic determination of aflatoxins. Microchemical Journal 73: 39-46. Stark, A.A. 1980. Mutagenicity and carcinogenicity of mycotoxins: DNA binding as a possible mode of action. Annual Review of Microbiology 34: 235-262. Tan, Y., Chu, X., Shen, G., and Yu, R. 2009. A single- amplified electrochemical immunosensor for aflatoxin B1 determination in rice. Analytical Biochemistry 387: 82-86. Ueno, Y., Kubota, K., and Nakamura, Y. 1978. Mutagenicity of carcinogenic mycotoxins in Salmonella typhimurium. Cancer Research 38: 536-542. W Turner, N., Subrahanyam, S., and Piletsky, S. 2009. Analytical methods for determination of myco toxins: A review. Analytical Chimica Acta 632: 168-180. Xiulan, S., Xiaolian, Z., and Jian, T. 2006. Development of an immunochromatoghraphic assay for detection of aflatoxin B1 in foods. Food Control 17: 256-262. 1. Abdullaev, F.I. 1992. Biological effects of saffron. Biofactors 4: 43-45. 2. Abdullaev, F.I. 2002. Cancer chemopreventive and tumoricidal properties of saffron (Crocus sativus L.). Experimental Biology and Medicine 227: 20-25. 3. Abdullaev, F.I., River´n-Negrete, L., Caballero-Ortega, H., Manuel Hernandez, J., Pérez-L´pez, I., and Pereda-Miranda, R. 2003. Use of in vitro assays to assess the potential antigenotoxic and cytotoxic effects of saffron (Crocus sativus L.) Toxicology in Vitro 17: 731–6. 4. Adegoke, G.O., Allamou, A.E., Akingbala, J.O., and Akanni, A.O. 1996. Influence of sundrying on the chemical composition, aflatoxin content and fungal counts of two pepper varieties—Capsicum annuum and Capsicum frutescens. Plant Foods for Human Nutrition 49(2): 113–117. 5. Akiyama, H., Goda, Y., Tanaka, T., and Toyoda, M. 2001. Determination aflatoxin B1, B2, G1 and G2 in spices using a multifunctional column clean-up. Journal of Chromatography A 932: 153-157. 6. Barbesgaard, P., Heldt-Hansen, H.P., and Diderichsen, B. 1992. On the safety of Aspergillus oryzae L.: a review. Applied Microbiology and Biotechnology 36: 569–572. 7. Bartine, H., and Tantaoui-Elaraki, A. 1997. Growth and toxigenesis of Aspergillus flavus isolates on selected spices. Journal of Environmental Pathology, Toxicology and Oncology 16: 61–65. 8. Berardo, N., Pisacane, V., Battilani, P., Scandolara, A., Pietri, A., and Marocco, A. 2005. Rapid detection of kernel rots and mycotoxins in maize by near-infrared reflectance spectroscopy. Journal of Agricultural and Food Chemistry 53: 8128–8134. 9. Caller, E., Marrubini, G., Brusotti, G., and Massolini, G. 2007. Development and integration of immunoaffinity monolitic disk for the on- line solid-phase extraction and HPLC determination with fluorescence detectionof aflatoxin B1 in aqueous solutions. Journal of Pharmaceutical and Biomedicalanalysis 44: 396-403. 10. Fazekas, B., Tar, A., and Kovacs, M. 2005. Aflatoxin and ochratoxin a content of spices in Hungary. Food Additives and Contaminants. 22(9): 856-863. 11. Institute of Standards and Industrial Research of Iran (ISIRI). 1382. Food products - Determination of aflatoxin B1 and total aflatoxins using HPLC and immunoaffinity column – Test method. 1st. Revision. ISIRI No. 6872. 12. Kamkar, A. 2006. A study on the occurrence of aflatoxin m1 in Iranian feta cheese. Food control 17: 768-775. 13. Martins, M.L., Martins, H.M., and Bernardo, F. 2001.Aflatoxins in spices marketed in Portugal. Food Additives and Contaminants 18(4): 315–319. 14. Negbi, M. 1999. Ed. Saffron: Crocus sativus L. In: Medicinal and Aromatic Plants - Industrial Profiles. Taylor & FrancisPublications, ISBN 978-90-5702-394-1. 15. Papp, E., H-Otta, K., Zaray G., and Mincsovics, E. 2002. Liquid chromatographic determination of aflatoxins. Microchemical Journal 73: 39-46. 16. Stark, A.A. 1980. Mutagenicity and carcinogenicity of mycotoxins: DNA binding as a possible mode of action. Annual Review of Microbiology 34: 235-262. 17. Tan, Y., Chu, X., Shen, G., and Yu, R. 2009. A single- amplified electrochemical immunosensor for aflatoxin B1 determination in rice. Analytical Biochemistry 387: 82-86. 18. Ueno, Y., Kubota, K., and Nakamura, Y. 1978. Mutagenicity of carcinogenic mycotoxins in Salmonella typhimurium. Cancer Research 38: 536-542. 19. WTurner, N., Subrahanyam, S., and Piletsky, S. 2009. Analytical methods for determination of myco toxins: A review. Analytical Chimica Acta 632: 168-180. 20. Xiulan, S., Xiaolian, Z., and Jian, T. 2006. Development of an immunochromatoghraphic assay for detection of aflatoxin B1 in foods. Food Control 17: 256-262.